Ironman Maryland turns up in the schedule a few weeks later than planned after the impact of Hurricane Joaquin forced its postponement. It’s rare we see events delayed like this, cancellation is the usual outcome in these cases. 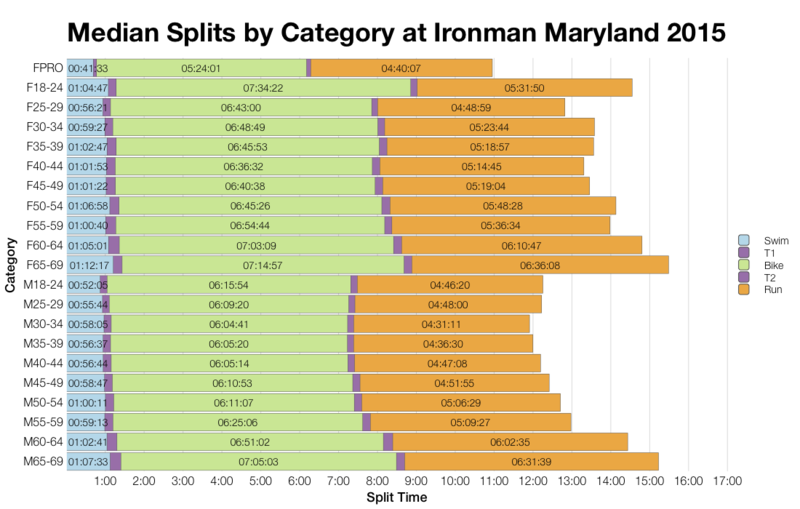 Rearranging the planning involved in Ironman racing is hard for both event organisers and athletes. So while the race went ahead as originally planned – except for a shortened swim – it’s not surprising that competitor numbers took a hit. The table above shows DNS and DNF numbers for the two years of racing at Ironman Maryland. 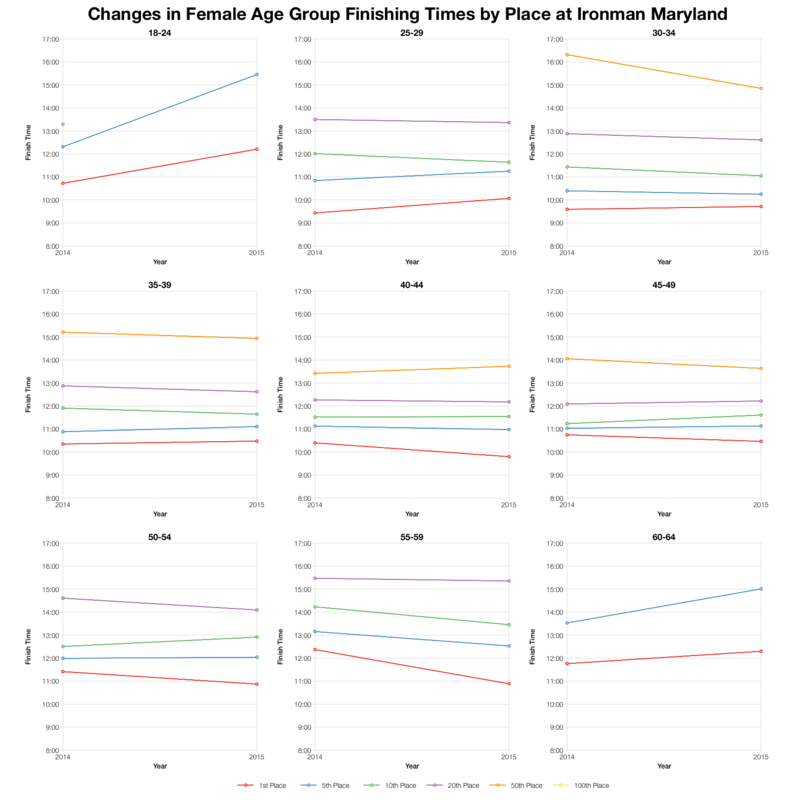 While athlete numbers grew significantly this year, with the move at least 40% didn’t make the new race date. It’s hard to distinguish DNS from DNF numbers from the live Athlete Tracker – precise figures will be available once final results are published – but swim DNF number should be low so the majority of that 48% figure will be DNS. 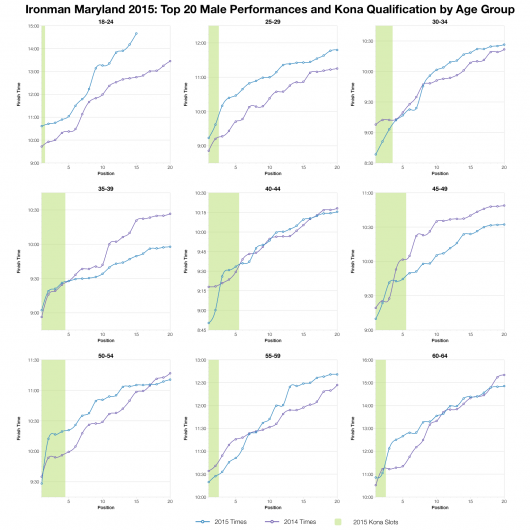 It’s not easy rearranging Ironman plans, or extending training by two weeks when you’ve already been tapering, it’s not surprising so many took up Ironman’s transfer offers. 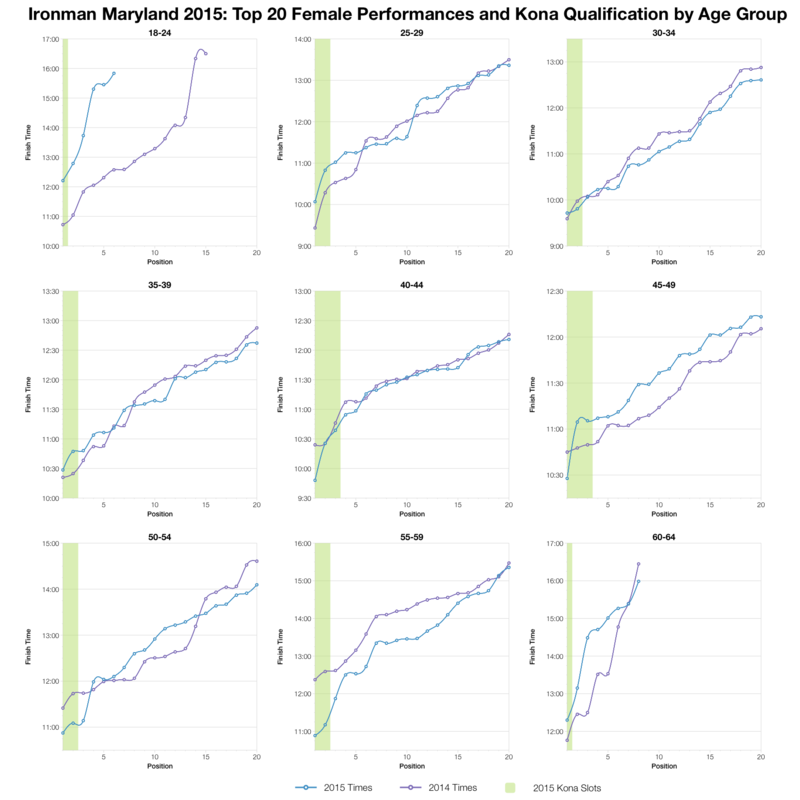 Both years in Maryland have seen a similar number of athletes so we should have a good comparison between result sets. 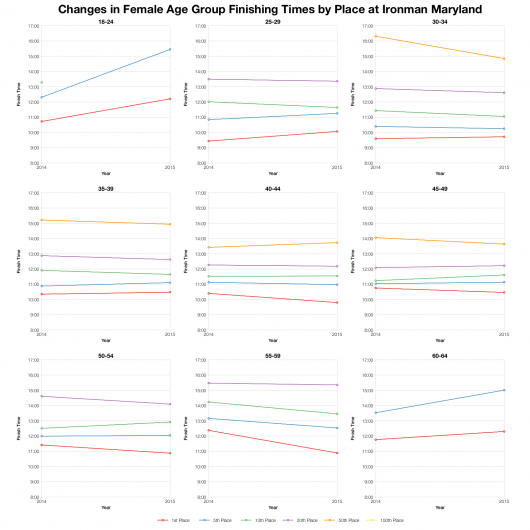 There are two big differences in this chart: swim times on the shortened course were significantly faster this year and bike times in windy conditions were significantly slower. The run was a little faster this year and combined with the much faster swim balances out the bike so finish times distribute slightly faster. 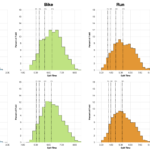 As we’d expect the median splits show the same pattern as the distribution: faster swim, slower bike, faster run. The differences are clear cut and universal leaving little doubt that his year’s bike conditions must have been tougher. Naturally a shortened swim is also going to produce much faster results, so no surprises there either. 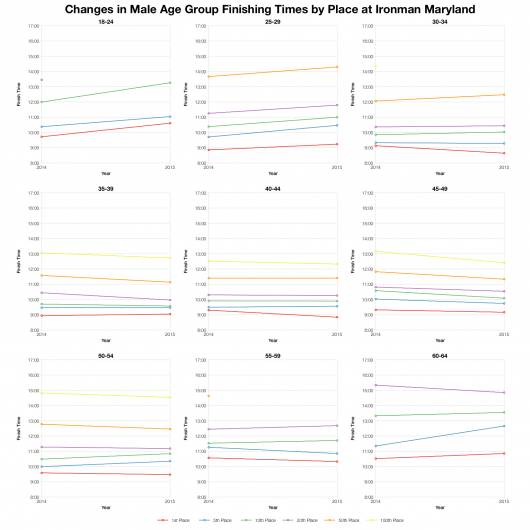 We know finish times trended a bit faster despite the much slower bike and this is reflected across the majority of age group places shown above. 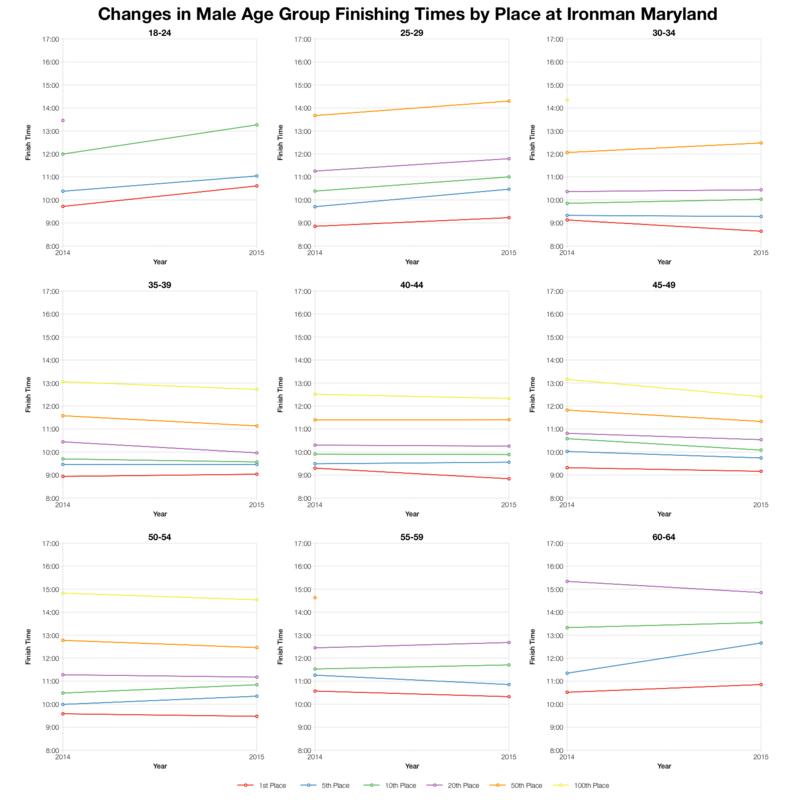 Changes aren’t huge (and they aren’t in the distributions either), but for many finishing positions times are the same or faster than the previous year. It’s not universal and there are certainly enough slower athletes in there too. 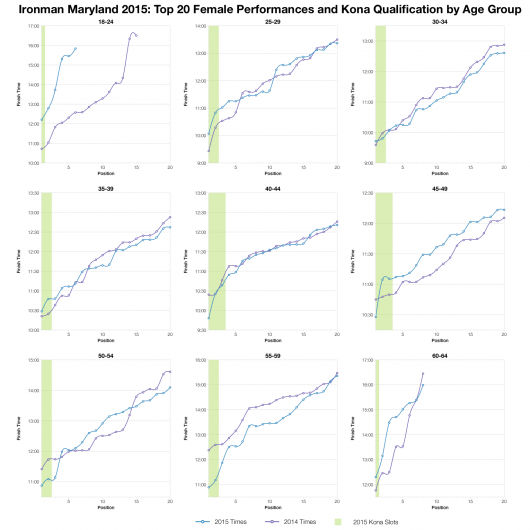 For the top twenty in each age group it varies a little by age group, but mostly times are comparable to the previous year’s results. The shift in swim and bike times appear to have balanced each other out and resulted in a very similar set of results at the front of pack. 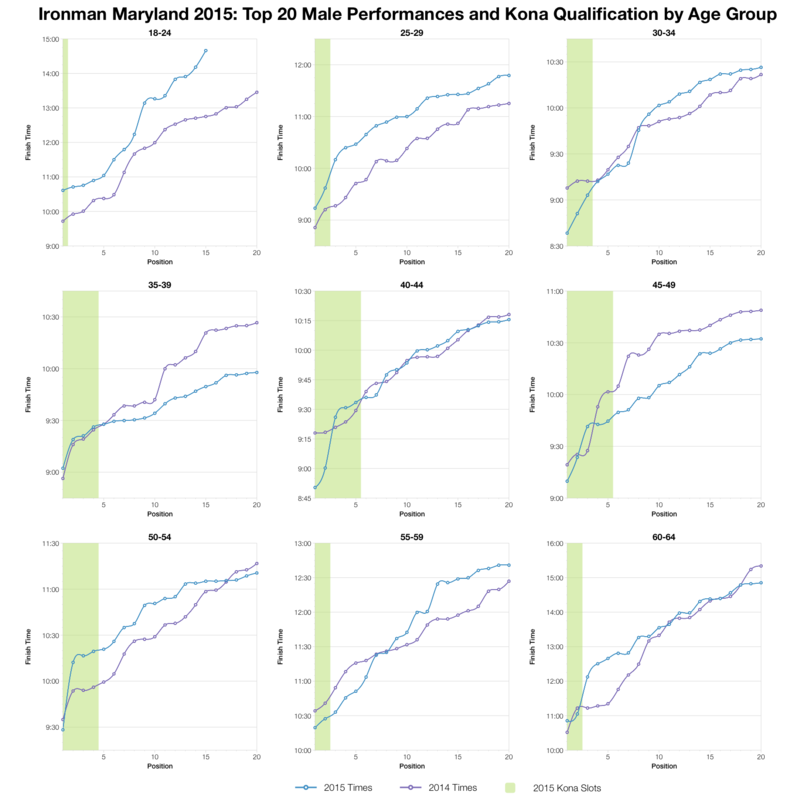 I will note that a lot of the Kona qualifying times were faster this year than last, those who claimed the slots stepped things up on a tough day. 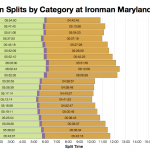 You can access a spreadsheet of the full results and splits for Ironman Louisville 2015 on my Google Drive.